No time for a full battle report tonight but here's a sneak peek as the Confederate attack goes in before the Union finishes its deployment. 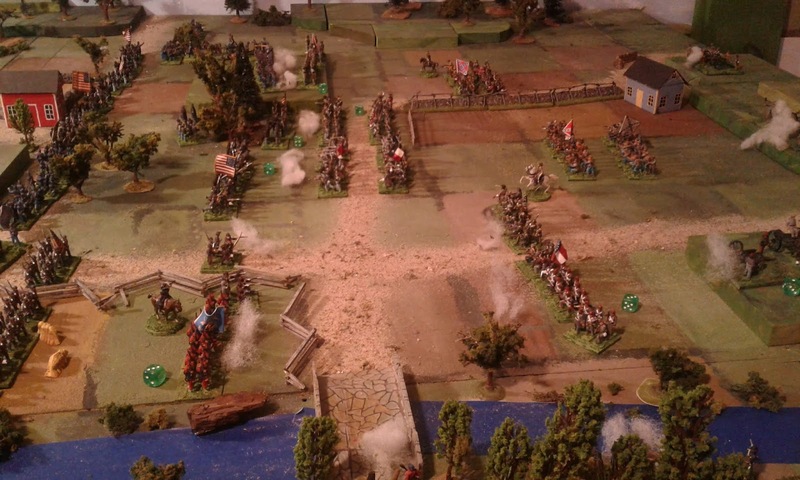 Picture taken about turn 4, just before I paused the game to reorganize from 6-8 stand Brigade units back to 4 stand Regiments, swapped rules, and then continued happily for 3 hours ! Switching rules and organization mid game? I never heard of such a thing! You are a wargaming tease on so many levels! I'm desperate to find out what happened on the tabletop ... and why you changed the rules and organisations halfway through! You need wait no more Bob! Yes! For heaven's sake finish the battle. As usual you have done a nice job in presentation. But I am wondering what would possess you from going to a brigade level game to a regimental one? The answer is in the latest post but its nothing very deep.